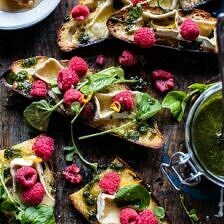 Honey Raspberry Brie Crostini with Basil Oil. Yep, we’ve got all that and more today. You guys, honest truth? If I could, I would eat this for dinner, lunch or even breakfast, pretty much every day of the week. I adore this crostini. 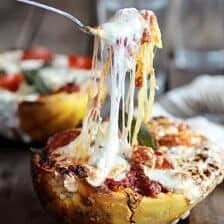 It’s always the simplest of recipes that I love most…okok and the ones with carbs, cheese, and fresh fruit…so typical for me. When I was doing my bi-weekly recipe brainstorming session the other week my mind was completely focused on three things: fresh eats with veggies, fruits galore, Mother’s Day, and Memorial Day. Yes, I did say Memorial Day, which I know is a little less than a month out, but my May is jam-packed and I’m trying to be super prepared and organized. Bottom line? I have warm weather recipes on the brain! This crostini however was not just inspired by a desire for warm weather eats. Nope, this one was mostly inspired by my mom and her love of all things bread, cheese, and raspberries. <–possibly three of her favorite foods…mom…would that be correct? I know you guys are well aware of this, but a lot of my recipes are inspired by the people around me, aka my family and friends. I love creating recipes that are going to put the biggest, happiest smile on the face of someone I love. It’s my favorite thing in the world. I knew the second this simple, almost like “oh duh”, idea came to mind that it was one my mom would love…and ask for over and over again. So yes, even though I will be in San Diego for Mother’s Day this year, my mom will somehow, someway, be eating this crostini. Start off with some really, really good bread. The bread is SO important here as it’s an ample essence to the recipe. I used a rustic loaf that I bought at Whole Foods. Toast the bread in the oven (or on the grill) with just a little olive oil and salt. Then add the brie and melt. Top with fresh raspberries, honey, and a drizzle of lemony basil oil. Finish with flaky sea salt and some watercress for a pop of color. So simple, fast and easy, yet so freaking good. No addictingly good. Trust me, you will not be able to stop and before you know it, your crostini will suddenly have turned into dinner. Been there, done that. Not sorry about it. Make this for Mother’s Day, and keep making it from now through summer. Trust me, do it, it is just so good! 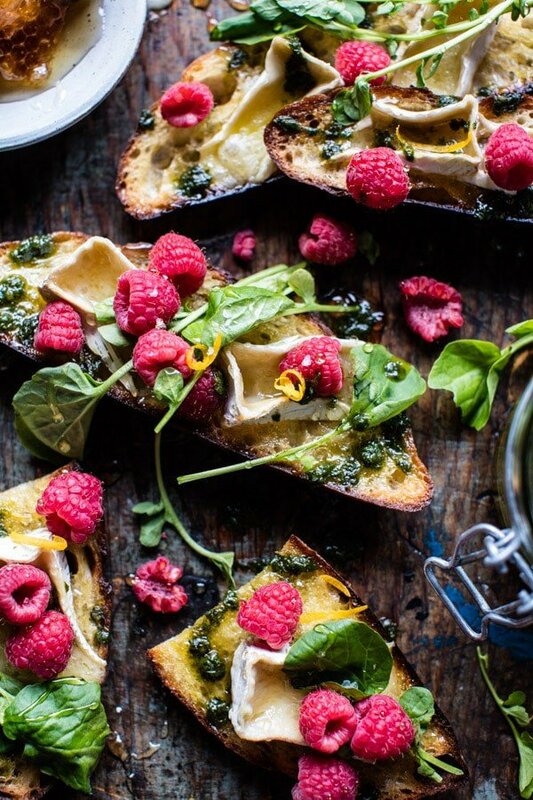 Hello, crusty bread, brie, raspberries, and honey. Enough said. OK. Doing a complete 360…. I was working on some interview questions over the weekend and one of the questions asked was what I thought set Half Baked Harvest apart from all the other food blogs out there. I said the obvious reason in my mind, my style of recipes. But I also said that I’ve always been very honest and open with you guys, my readers. I have shared so much about me and my life with you all that I feel some of you may know me more than I know myself…if that makes sense, which it doesn’t, but hopefully you get what I’m trying to say here! You guys know me in and out, and I think it has made this blog a fun place for a lot of you to come to everyday, somewhat of a place to escape from your own lives. I know I have my own little escapes! This got me thinking though, lately I’ve been feeling super anxious and I wondered if any of you ever feel this way when you’re stressed about things or have some bigger, or unfamiliar, things on the horizon? I’ve always struggled with anxiety and while I know I am not alone, it’s still not easy. 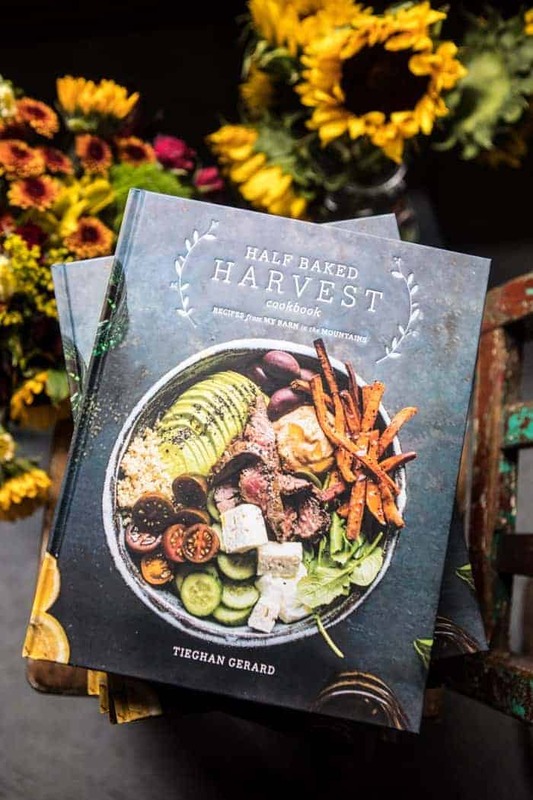 With the release of the Half Baked Harvest Cookbook, and some other fun projects in the works, I’m all things excited and anxious at the very same time. Anyone else get those feelings? Anyway, totally random I know, but I just want to share a little of what’s going in my head! One thing that always helps me? Talking about it…and then cleaning….and then making toast with brie and raspberries for my mom and I while I pretend everything else in the world doesn’t exist for ten minutes. Obviously 😋. 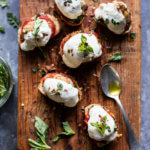 This crostini is so quick to make and the flavors are out of this world! 2. Place the slices of bread on a baking sheet and drizzle with olive oil on both sides. Sprinkle the toast with salt. 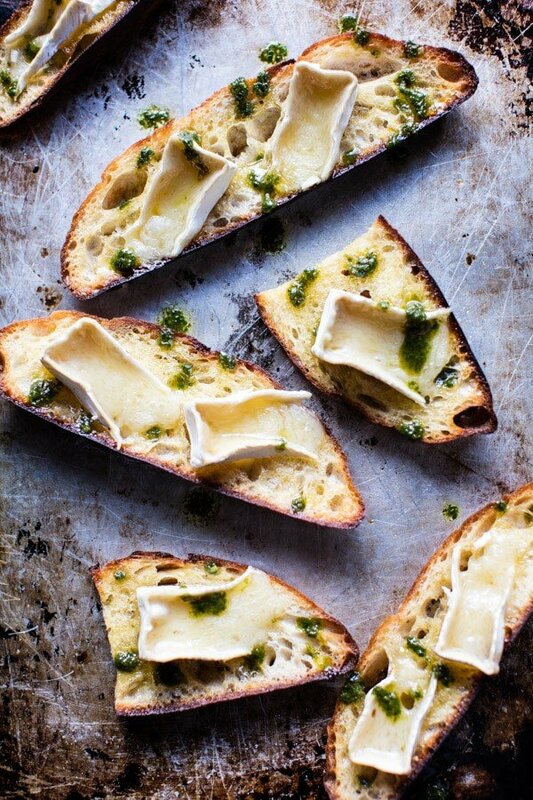 Transfer to the oven and cook 5 minutes and then flip the bread and add the brie to each piece. Return to the oven and cook 5 more minutes. 3. Transfer the bread to a serving board. 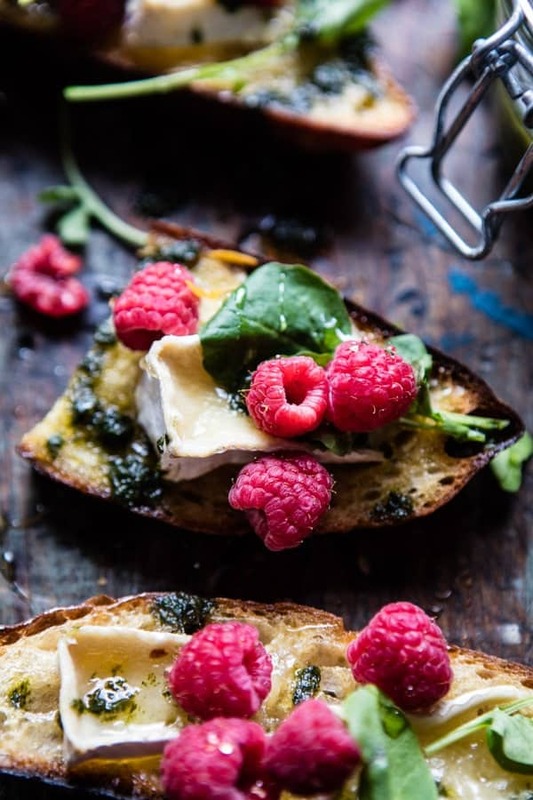 Top with raspberries, drizzle with honey and basil oil (recipe below). Top with watercress. EAT. 1. Combine all ingredients in a blender and pulse until smooth. Taste and adjust salt as needed. Serve with the crostini. Tuesday night crostini dinner. Yes and YES. 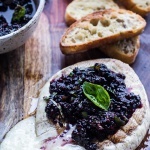 Grilled Brie with Blackberry Basil Smash Salsa. 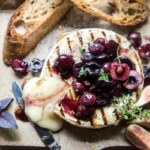 Honey, Thyme and Sweet Cherry Grilled Brie. I love this! I’ll start looking out for early raspberries. The basil oil is genius! I’ve always had anxiety too, the worst was in my early twenties, but around 23 it got much better. 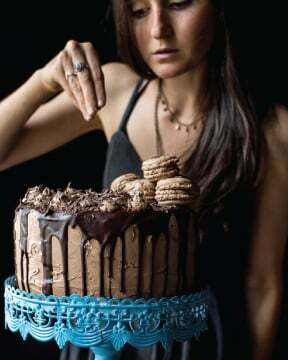 Now, when I feel restless, I read food blogs. Yours is my favourite. It distracts me, lifts my mood, and also helps me remember to keep eating when my stomach is filled with stress. What a perfect coping mechanism!! I totally do that as well! Thank you so much Marian! ah, brie… I can’t even, I’m addicted to brie and camembert. must be all that french blood in my veins!! SO am I!! Its so good! I love this combination. 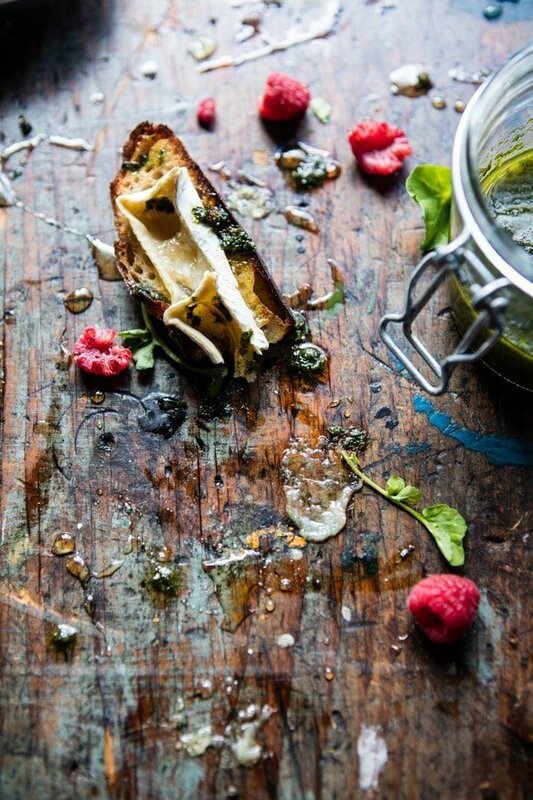 This Creamy appetizer brie with the sweet touch of the honey and the drizzle of fresh basil oil. Great and easy appetizer! I love raspberries. This combination is a great idea! I love the combo of fresh fruit and cheese YUM! I could totally have this for ALL the meals in a day. And I COMPLETELY understand about the anxious thing. I work my brain up all day long and that’s why I run/lift because it literally clears my head! Annnndddd not that it’s important or relevant, but I had a meeting last week and I could FEEL my face turning beet red as I talked! GAH! You are not alone! Thanks Amanda!! The anxiety is no fun! But having ways to get rid of it is nice! Yum! Brie and raspberries? Sign me up! Yes!! I;m all about the combo! Thanks Lindsay! 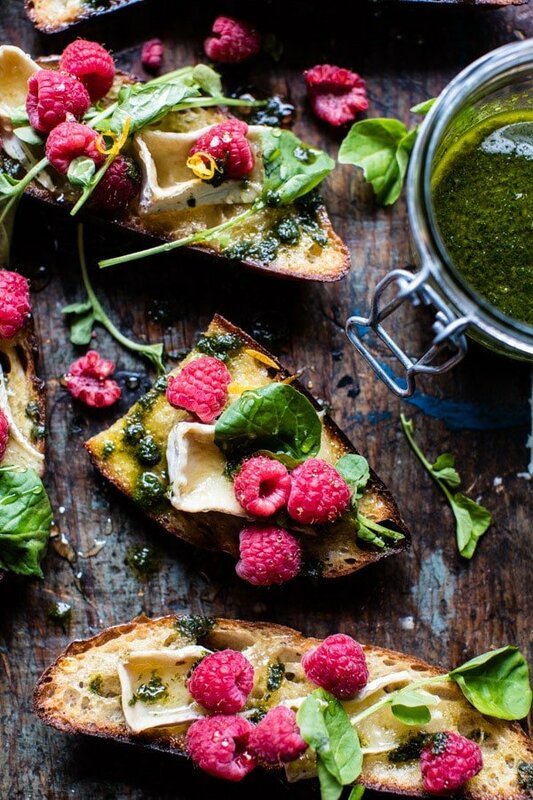 There’s so much to adore about this crostini!! What a mouthwatering mix of ingredients! You give each day 110%–the readers know this and appreciate it. Thanks for sharing your life on your hilltop sanctuary. But we also enjoy your adventures. Easy recipes like this are so perfect during the warmer months when you don’t want to stand in a hot kitchen. Now, I just spring to get here. Yes! So perfect for that, so happy you like it Nicole, thank you! Sometimes I feel like you’re my spirit animal. Today is one of those days! Although I just found your blog, it’s funny how much I feel like I know you! I am the oldest of a large family and my sister is 12 years younger than me. I used to love cooking/baking for her when my parents were out and about. That’s when I also realized I loved to make yummy food!! Hi!! Going on a hike totally helps me to!! 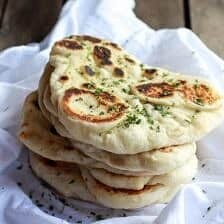 Thank you so much for reading/making my recipes! Hope to hear more from you Libby! This looks delicious. I’m thinking this would be perfect for my oldest daughter’s bridal luncheon. Just have to find what fresh fruit would be good in December in Georgia!! So happy you like it Mandy! Hope you enjoy, thanks Mandy! You’re definitely not alone with the anxiety! Keeping busy with things I’m passionate about helps me focus my thoughts, but anxiety is something I live with on a daily basis. This recipe is so pretty and you sound like a really sweet daughter! Tieghan these crostini are so beautiful! It’s hard to beat fresh bread, melty cheese and juicy berries! Well, peanut butter and chocolate are up there too haha. I experience anxiety as well (being a perfectionist doesn’t help), so I completely understand how you’re feeling. Exercising, eating and drinking healthily, getting enough sleep, and getting a few good laughs in every day help a lot. I know you’re probably doing most of those already 🙂 But girl, you’re super talented and have nothing to worry about! Just keep doing what makes you most happy and everything will fall into place. SO happy you like it Elizabeth! Thank you! Fruit and dairy are my two favorite food groups. I’d have no problem being totally vegan if I wasn’t a cheese addict. 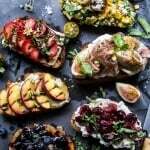 I bet this crostini would also be lovely in the fall with apples and cinnamon oil? But no doubt you already have a recipe for that (and I’m channeling an old blog post by you I’ve forgotten…). Hey Christine! haha! I am the same, I could totally be vegan, but I need cheese. lol! LOVE the sound of this with apples and cinnamon. Oh my gosh. YUMMM! Thank you for sharing this tip with me. It totally makes sense! I am excited, but anxious, but I know it is going to help my business, so I gotta do it! It’s a good anxious! 🙂 You are so sweet for sharing, thank you, thank you! Hope you are having a great weekend! I’m with your mom on this one! How can a person go wrong with bread and cheese.. and raspberries?! 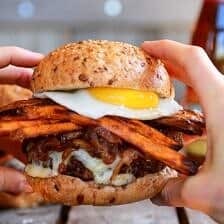 This looks perfect for a snack dinner or breakfast. or for anything really. Haha Thank you so much! So happy you like it! I’ve been coming to your blog for a while now, but have never commented or posted. I love Half Baked Harvest because it has personality. You make me feel like I have capacities and skill to cook anything. You recipes are inspired and different, and your passion for food shines through the text. I have an alarm on my computer at work. Every day at 4, I sift through all your posts, and find the perfect recipe for dinner. I jot down the ingredient list, and everyday on my way home from work I stop at the grocery store and cook something up. Half Baked Harvest is reliably great (not just good!). You provide a great mix of healthy and indulgent, which reflects the way I like to live my life… Balanced. 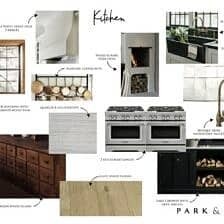 You inspire me everyday, and I’m so excited for you to explore all the new opportunities that will surely come your way as a result of this cookbook! This looks so fresh and simple! It would be a great appetizer for mother’s day. 🙂 And you’re definitely not alone with the anxiety. I agree, it always helps to talk about it. I hope you’re having a great week! Hope your mom loves it Caroline! Thanks so much (: Hope you have a great week/weekend! Brie and fruit, you can never go wrong! The basil oil sounds perfect too. Looking forward to trying this recipe out! I get almost frozen with anxiety when something new/unfamiliar/scary is on the horizon so I can absolutely relate. For me, running helps relieve some of the stress and so does talking with friends who help me keep things in perspective. Having faith for me, helps me keep things in perspective and know that while I can’t see the whole picture or how things will turn out, someone else can. You have built a really special blog community and you clearly have a gift for creative and unique content creation. On a less related note, these crostini’s look absolutely delicious. Its so nice to hear how other people cope and that i’m not alone! So thank you for that! I so love your site & am delighted to find you aren’t into all the organic stuff! Seems all the other blogs I get with recipes, are all for organic! Now I’m not adverse to organic but come on enough is enough! I’ve been cooking & adding my own tweek to alot of recipes & usually get loads of compliments, if not, I toss it! I also make up my own! Guess my age gives me lots of leeway! You keep on keepin’ on & do your thing ! No need for stress unless it helps control things, and we can’t. Just a thought. Thanks for this space! SO happy you like the blog Barbara! Adding your own flavor to them is what its all about! So happy your doing that! I made this for myself for breakfast on Thursday. I took a picture and sent it to my sister to make her jealous (which worked well). Also on the plate were some slices of avocado, some sliced cherry tomatoes and a big dollop of greek yoghurt with honey – all the sorts of things you add anyway! It was divine. The basil oil, honey, raspberry, brie combo was just gorgeous. Thank you! Haha that is great! Thank you so much! This looks amazing! 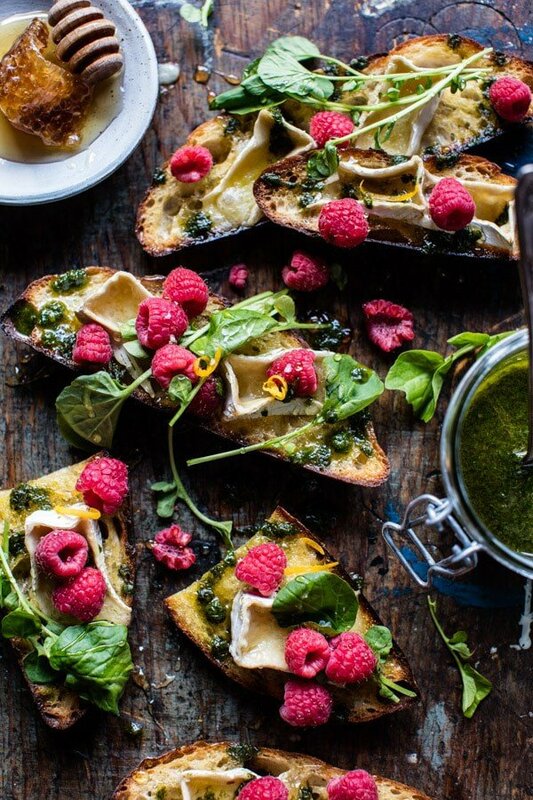 I wanted to make this for a crowd – offering some mini crostini three ways for a brunch soon. Can you tell me how much of this I can do in advance? Obviously I don’t want the bread to be soggy. Maybe just the cutting and prepping and toasting of the bread? Hoping there’s a trick here because I’ll be limited on time. It was a hot day yesterday, so instead of turning on the oven to make dinner, I just made this and it was excellent. 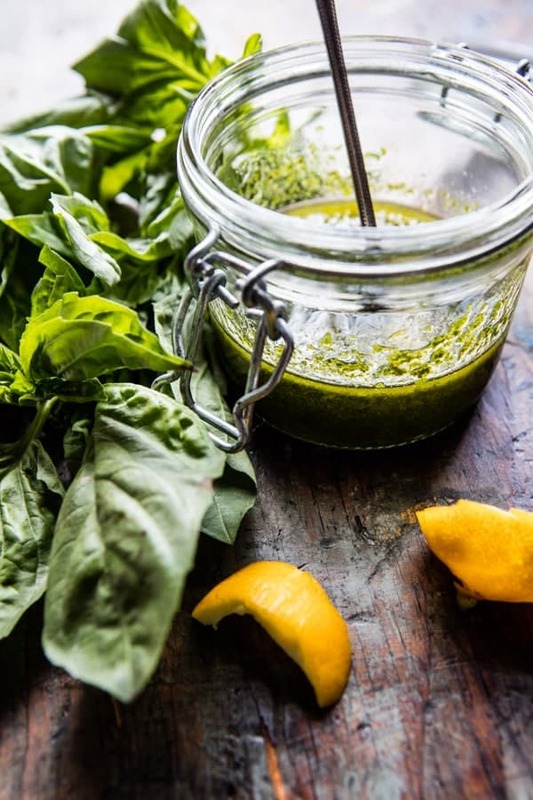 I’m enjoying the basil oil over a salad now and I will be making this one again and again. Thanks! site dаilʏ, if so afterward you will without doubt obtain nice knowlеdge.